Connect your tablet or notebook up to your digital monitor. 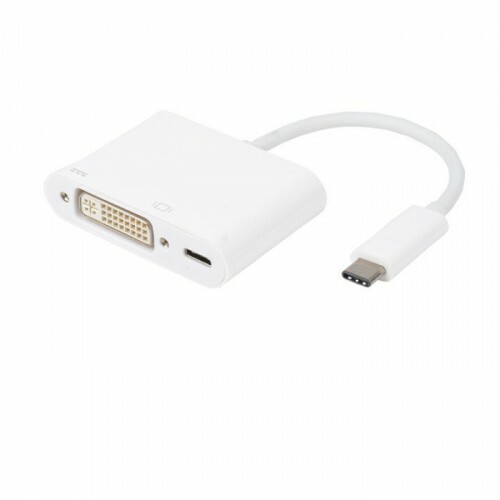 This USB Type-C to DVI Adapter lets you output perfect digital video DVI signals from your fancy new USB 3.1 Type-C equipped machine. Simply connect the Male Type-C plug to your computer's Type-C socket, then connect a DVI Cable of your preferred length. You can also connect a charging cable to the USB-C port to charge your MacBook. Experience up to 5 Gbps transfer rates, up to 10X faster than USB 2.0 (480Mbps). You will be amazed at the difference USB 3.1 makes.